This article is about the prophet to whom authorship of the Book of Obadiah is attributed. For other uses, see Obadiah (disambiguation). 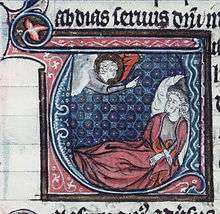 God appearing to Obadiah in his dream (France, 13th century). Obadiah (pronounced /ˌoʊbəˈdaɪ.ə/, Hebrew: עובדיה‎‎ ʿOvadyah or עבדיהו ʿOvadyahu, or in Modern Hebrew Ovadyah; "slave of god") is a Biblical theophorical name, meaning "servant of God" or "worshipper of Yah." The form of Obadiah's name used in the Septuagint is Obdios; in Latin it is Abdias. The Bishops' Bible has it as Abdi. According to the Talmud, Obadiah is said to have been a convert to Judaism from Edom, a descendant of Eliphaz, the friend of Job. He is identified with the Obadiah who was the servant of Ahab, and it is said that he was chosen to prophesy against Edom because he was himself an Edomite. Moreover, having lived with two such godless persons as Ahab and Jezebel without learning to act as they did, he seemed the most suitable person to prophesy against Esau (Edom). Obadiah is supposed to have received the gift of prophecy for having hidden the "hundred prophets" (1 Kings 18:4) from the persecution of Jezebel. He hid the prophets in two caves, so that if those in one cave should be discovered those in the other might yet escape (1 Kings 18:3-4). Obadiah was very rich, but all his wealth was expended in feeding the poor prophets, until, in order to be able to continue to support them, finally he had to borrow money at interest from Ahab's son Jehoram. Obadiah's fear of God was one degree higher than that of Abraham; and if the house of Ahab had been capable of being blessed, it would have been blessed for Obadiah's sake. In some Christian traditions he is said to have been born in "Sychem" (Shechem), and to have been the third centurion sent out by Ahaziah against Elijah. The date of his ministry is unclear due to certain historical ambiguities in the book bearing his name, but is believed to be around 586 B.C. Russian icon of Prophets Amos and Obadiah, 18th century. He is regarded as a saint by several Eastern churches. His feast day is celebrated on the 15th day of the Coptic Month Tobi (January 23/24) in the Coptic Orthodox Church. The Eastern Orthodox Church and those Eastern Catholic Churches which follow the Byzantine Rite celebrate his memory on November 19. 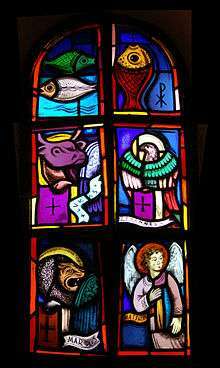 (For those churches which follow the traditional Julian Calendar, November 19 currently falls on December 2 of the modern Gregorian Calendar). He is celebrated on February 28 in the Syriac and Malankara Churches, and with the other Minor prophets in the Calendar of saints of the Armenian Apostolic Church on July 31. According to an old tradition, Obadiah is buried in Sebastia, at the same site as Elisha and where later the body of John the Baptist was believed to have been buried by his followers. It is related to "Abdeel", "servant of God", which is also cognate to the Arabic name "Abdullah" or "Obaidullah". Turkish name Abdil or Abdi. the servant of king Ahab of Israel (1 Kings 18:3). According to the rabbinic tradition, the tradition of the Eastern Orthodox and Oriental Orthodox Churches, this is the same individual as the prophet. The name Obadiah is similar to the Arabic name 'Obaidah' and also 'Obaid'. The former having the meaning of 'servant of god' and the latter meaning 'slave' or 'young slave'. The similarity of meaning is thought to be due to Arabic being the sister language of Hebrew. ↑ New Bible Dictionary, second edition. Tyndale House Publishers, Inc., Wheaton, IL, USA.